Have you ever wanted to buy your Husband or Wife an extremely creative and different gift? I often try to come up with creative ideas that my Husband will not only love, but that he will never forget. 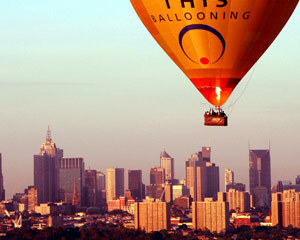 How about Hot Air Ballooning in Melbourne? How about a Jet fighter flight? My Husband would love either of these gifts. The only reason I have not done them yet is that I didn't really know where to go to sign up for an adventurous afternoon like this. Now I do, particularly when we visit Australia. Adrenalin has adventurous and fun gift ideas for all over Australia and the Globe (New Zealand, Moscow, etc.) . You can sign up for their emails and get their great deals sent straight to your email account. Adrenalin has everything from Skydiving to Jet Boating to swimming with crocodiles to White Water Rafting to Orbital Space Flights. While we don't do anything super adventurous too often, we would love to! I actually have some plans for white water rafting in September in North Carolina. Disclaimer: This is a sponsored post. I was compensated for this post, but the thoughts and views are 100% my own opinion.